The Real JDavis videoed these turkeys slowly circling a dead cat on a Randolph street this morning. Boston Magazine talks to a turkey expert to get answers on why. Gordon's "drawing," DreamWorks drawing, Disney coloring-book drawing. A federal jury today convicted Jayme Gordon, 51, on wire fraud and perjury charges for his attempt to force DreamWorks to pay him for what he claimed was his prior work on a story about a fighting panda. Read more. Gordon's drawing, DreamWorks drawing, Disney coloring-book drawing. A Randolph man who sued DreamWorks on charges they ripped off his ideas for a panda who becomes a kung-fu master was indicted by a federal grand jury on charges he was the one trying to rip them off. Read more. Boston Police report the man shot to death at 41 Hosmer St. in Mattapan Wednesday night was Darwin Adilas, 21, of Randolph. Two other men were also shot but are expected to recover from their injuries, police say. A Franklin man was arrested on a charge of operating under the influence of drugs after he allegedly drove his car right into Route 240 bus in Randolph this morning, Transit Police report. Transit Police, who released the video of the crash, say 13 of the 34 passengers on the bus were taken to local hospitals for treatment of non-life threatening back and neck injuries after the crash, around 10:40 a.m. on North Main Street. Stephen Griswold, 30, is scheduled for arraignment tomorrow in Quincy District Court. Transit Police report they are investigating what led a 24-year-old from Roxbury to drive into a stopped Route 240 bus around 10:30 a.m. on North Main Street in Randolph. The car driver was taken to Boston Medical Center, where he died, police say. Nine passengers on the bus were taken to local hospitals with non-life threatening injures. The bus and the 2007 Infiniti were towed from the scene, according to police. My one year old saw it and roared. Which was my entire reason for the request. Randolph officials are majorly pissed over the 75 truckloads of snow a South Boston property manager had dumped behind a Main Street bakery, right on top of some wetlands that feed the drinking-water supplies of three towns, Channel 4 reports. 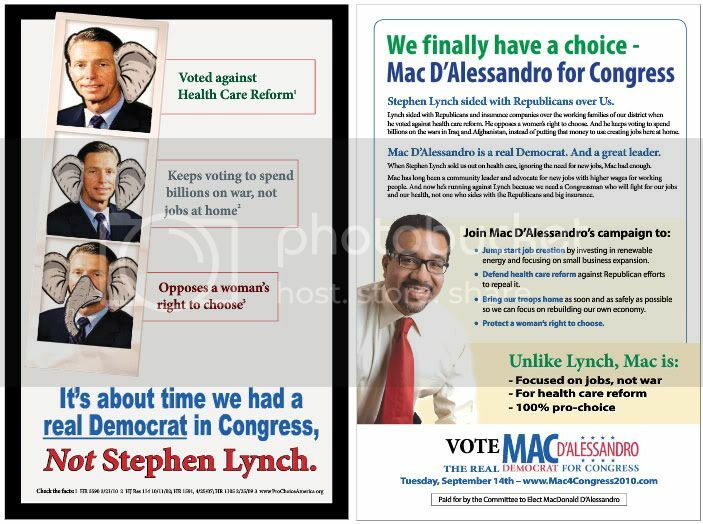 This is the mailing that has Stephen Lynch in a tizzy. Where does Rep.Stephen Lynch stand on the issues? Lynch plays his cards close to the vest in what seems like a defensive style of politics. It certainly is not leadership-driven. Take his process on the health care bill debate last summer. From March through August we heard Rep.Lynch say he didn't know how he'd vote on the bill. At the same time, he did not take a leadership role in shaping it. In August at Curry, Rep. Lynch held a town hall meeting and said he had read the bill but still didn't know how he was going to vote. Once again, his constituents could not get a bead on where he stood. Perhaps even more stunningly at that town hall meeting, Rep. Lynch was given the chance to answer a question about death panels (after all he had read the bill) and refudiate (sic) ;-) the meme that right wing Republican liars and Fox News had made popular. Lynch equivocated! He would not take a stand! A federal appeals court today upheld a two-week suspension of Randolph's fire chief for discussing budget restraints at a press conference in front of a fatal fire. Randolph selectmen suspended Charles Foley for seeming to link Proposition 2 1/2 to the deaths. Foley appealed in court, arguing that violated his First Amendment rights. Officers arrived at Picadilly Pub to find no one there. The suspect handed Pharmacists a white plastic bag and told him to fill it with Oxy's and Percocets.The suspect was able to get 116 Oxycontin tablets. Friends of the Blue Hills continue to fight the request of the owner of the Lantana function hall in Randolph to turn 3 acres of the Blue Hills reservation into a parking lot. The Globe has the details (note to Globe, as Matt King notices, you might want to do something about the URL on that story). Three years after he was exonerated and released from jail.